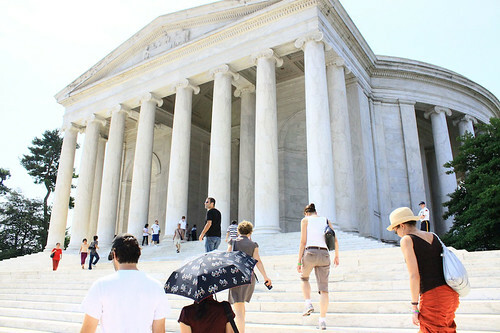 Our team has returned from D.C. safe and sound with tremendous successes and new friends to tell of. Our interviews with the foremost experts in the field of Cystic Fibrosis, organ transplant, and minority health issues proved that the work of THE POWER OF TWO resonates with many levels of policy makers, scientists and doctors. 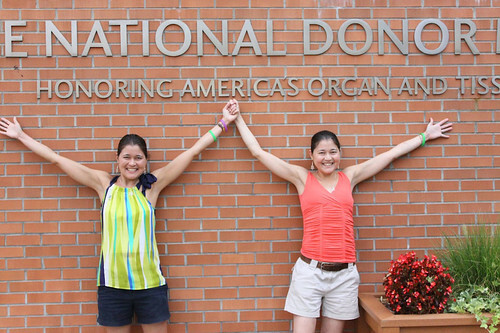 The trip was also special for Ana & Isa as they visited national landmarks and cultural havens, while they also experienced powerful interactions with other organ recipients. Explore our photo journal to learn more! 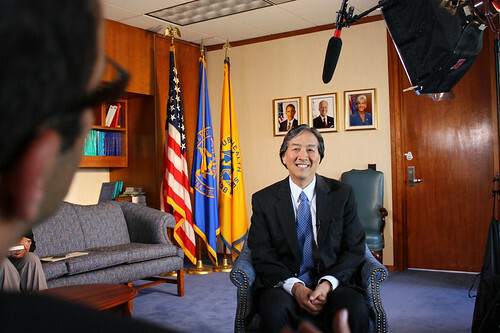 We achieved audience with the two most prominent Asian Americans in government to discuss APIA public health! 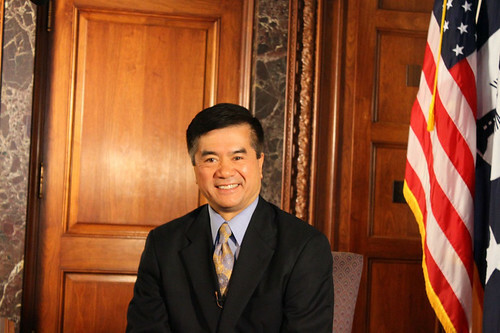 Secretary Gary Locke: Secretary of Commerce. Locke spoke on the importance of Asian American participation in the bone marrow registry, a focus of his over the past decade. 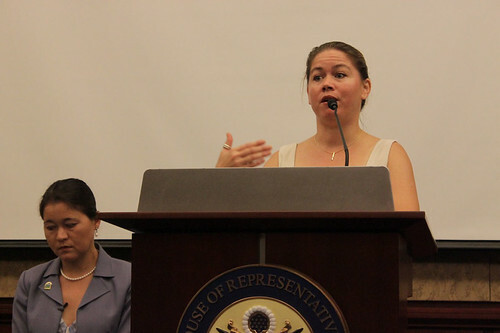 THE POWER OF TWO hosted a briefing on July 15 to highlight issues of Asian American public health. 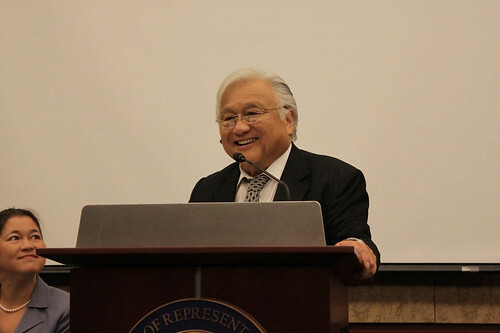 Rep. Mike Honda opened the briefing highlighting the importance of organ donation among APIA communities and the potential for Ana & Isa’s story to change lives. He even registered to be an organ donor right then an there, signing his driver’s license at the podium! Corinna Dan: Hepatitis B Policy Fellow at AAPCHO Association of Asian Pacific Community Health Organizations. Corinna spoke eloquently about her amazing expertise on hepatitis B, an urgent health concern for APIAs. Yul Kwon: Deputy Chief of the Consumer and Governmental Affairs Bureau for the Federal Communications Commission (FCC); Survivor champion. Kwon came to the cause of bone marrow donation during college when his life long friend died of leukemia while waiting for a transplant. This tragedy compelled him to advocate organ donation among Asian American communities for the last 10 years, combating the individualistic ideals of his generation. In 2006, Kwon competed on Survivor: Cook Islands to disprove negative stereotypes about Asian Americans- and won. Congresswoman Zoe Lofgren: Chair, California Democratic Congressional Delegation & Member, Cystic Fibrosis Caucus. 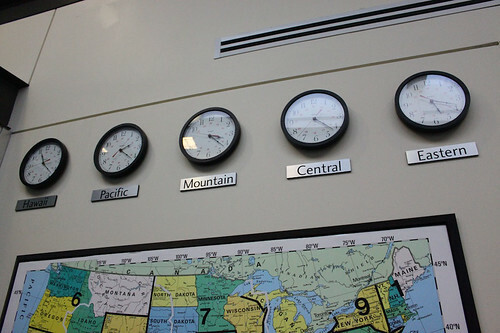 Zoe, Ana & Isa sat down for a discussion about how caucuses get things done for patients. Zoe explained how the 2010 health care reform is changing things, and how patients can be advocates to help her be more effective. Dr. Clive Callender: Transplant Surgeon; Founder of MOTTEP (Minority Organ & Tissue Transplant Education Program). Callender is the foremost specialist in organ transplant medicine in the U.S. and a life long organ donation advocate. This bright and engaged surgeon works at Howard University- a long time helm for African American health issues- and still performs organ transplants at over 70 years old! 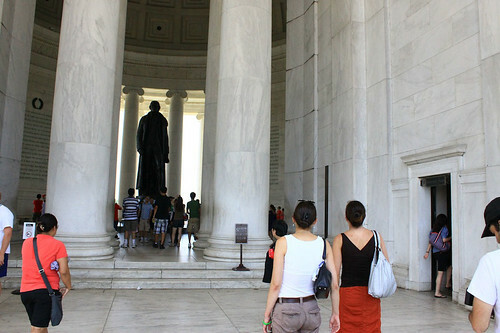 Exploring D.C. memorials and cultural landmarks with Ana & Isa. Elizabeth Miller, Doni Bell, Ana Stenzel & Isa Stenzel Byrnes meet for the first time! This was a special and powerful connection for Ana, as Doni Bell is the pancreas and kidney recipient of James- Ana’s lung donor. Celebrating the successes of our D.C. trip at Churchkey in D.C.! 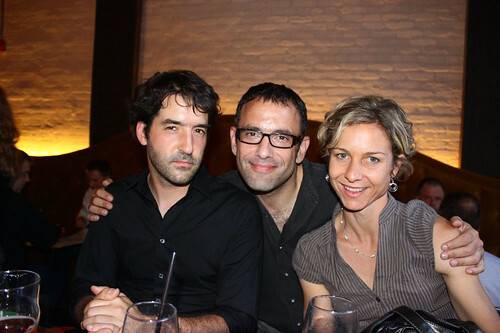 Matthew & Peter Slutsky: These twin brothers run Change.org (Matthew) & Ning (Peter) and collaborate on DoubleSpeak Media. The brothers are also midway through filming their own documentary, “The Delegates.” They instantly bonded with Ana & Isa, noting that they had never met another set of twins so closely connected. 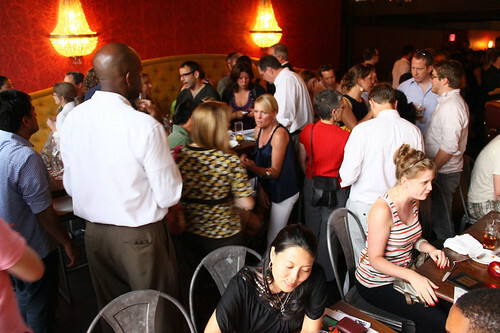 Our team, friends and supporters took over a good portion of Churchkey. Team Maryland made a great show or participation, and we were glad to have Sonya Swinton of Internet Celebrity Magazine documenting the evening! A day in Richmond, VA to tour United Network for Organ Sharing (UNOS) headquarters and gather with organ recipients at the Memorial garden. The national UNOS call center where organ sharing is coordinated. Anne Paschke guided us in a tour of the beautifully designed outdoor National Donor Memorial, where we gathered with organ recipients for a moment of gratitude. Freda leads the group of transplant recipients in prayer. 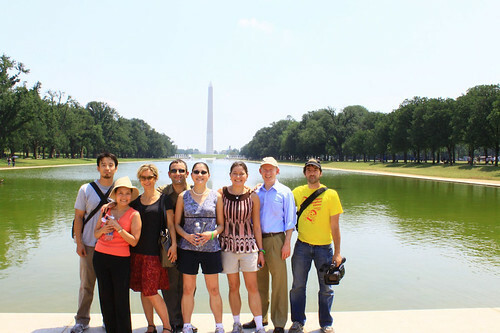 We were glad that George and Doni from Team Maryland (2010 U.S. Transplant Games) joined us at the Memorial! 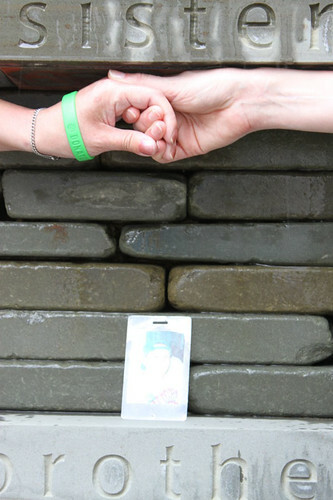 Ana and Doni are moved to find that JAMES has been added to the wall of names, which pays homage and remembrance to all organ donors. 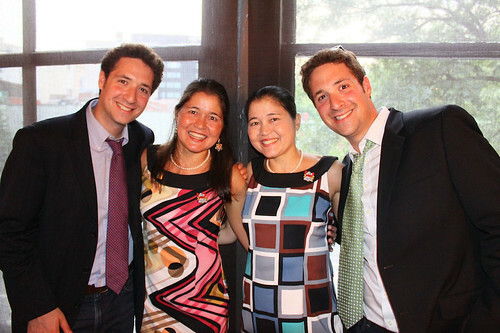 Ana & Doni with a photo of their donor, James. Our crew: Yasu, Naomi, Jennifer, Marc, Ana, Isa, Andrew, Nickolas, Matt (behind the camera). Thank you to each and every interviewee, volunteer, friend, supporter, and facilitator who made this trip the huge success that it was. For more photos, see the entire week cataloged on flickr! A joy to be included in your fabulous journey. I’m exhausted just watching you two travel the world. Thanks for all the work you are doing for others.